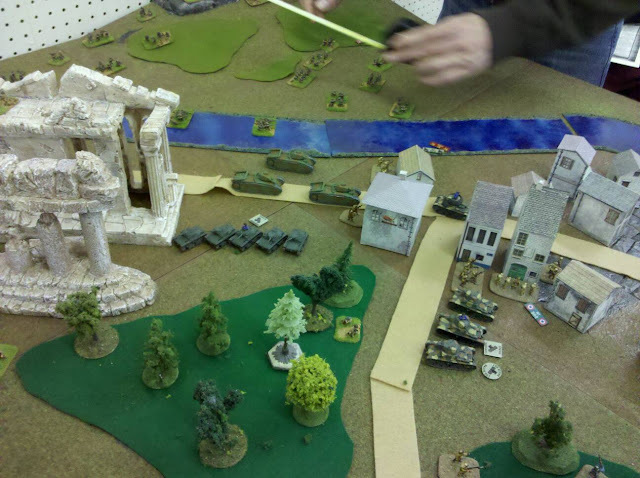 Robertson's Rules of Disorder: Flames of War - more photos! Here are the Italian tanks assaulting the village held by the French Foreign Legion. 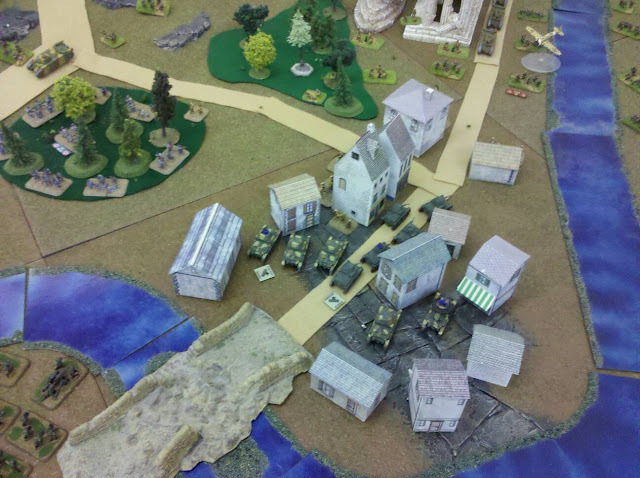 The Legion held out for a short while, but the concentrated MG fire from the Italian tanks was too much for the Legion and they pulled back into a corner of the town to try to hold on to a part of the objective for as long as they could. The Italians lost an entire Bersaglieri platoon in the assaults while the platoon of the French was reduced to half of their initial strength. A view of the French defense in depth of the roadway toward Marseille. You can see the Italian air support attacking the French Mortar platoon which has been harassing the Italians at range all game. The French mortar platoon pinned down and eliminated several Italian stands and was by far the most effective thing the French fielded this battle. For sheer enemy commander harassment they rated a 10. 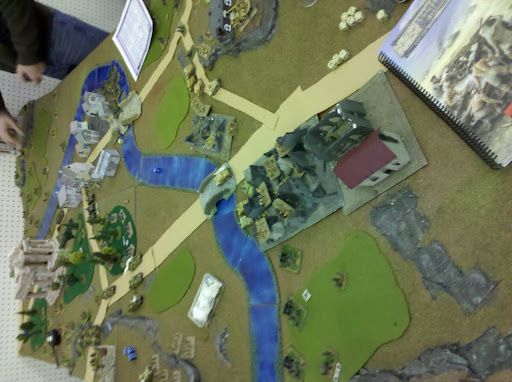 The Italian commander went out of his way to try to neutralize them - without effect until late in the game! Here is a view of the Italians holding the heights of the hills surrounding the river valley with artillery and AA guns in the anti-armor role. The Italians did not have the 90mm gun on truck in 1940, but they did have a 102mm gun on truck - so we rated it as an Anti-Tank of 10 because the gun did not have a solid core projectile, merely a very large HE round to lob at targets. They did their job, buy only just. They were instrumental later in the game for halting the French beginnings of a counter-attack cold. Another view of the battlefield showing the Italians moving across the shallow river following the Bersaglieri and tank assault into the village toward the ruins and Marseille. The forest immediately to the left in this photo is filled with French Foreign Legion in WWI uniforms where they have dug in to hold the line. They will prove critical in later stages of the fighting. A view of the Italian left flank showing the difficulty in forcing the roadway to Marseille. A platoon of Char B1 bis tanks hold the high ground flanked by dug in Foreign Legion troops. They are also bolstered by French metropolitan troops holding a ruin on the heights. The light green patches are vinyards or orchards which provide cover and block line of sight through them, but are otherwise of no consequence. 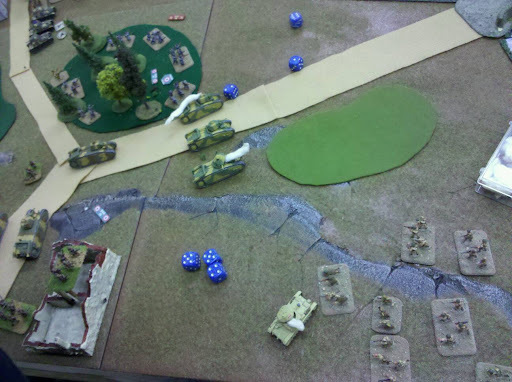 The lone Italian tank on the high ground is the lone burning vehicle of an entire platoon which attempted to force the high ground and found out how deadly the Char B's guns were at close range. The one Char B which is smoking is due to the Italian AA on the opposite ridge. This is an odd view for the Blog, because I didn't rotate the photo. 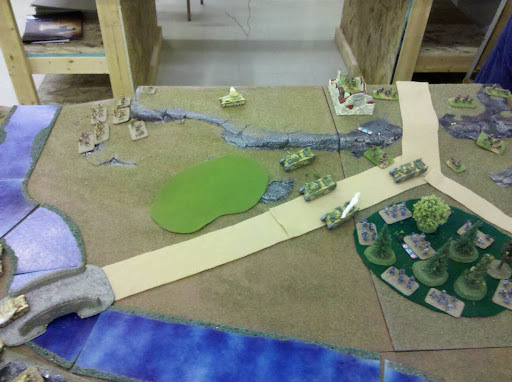 This is a lengthwise photo of the battlefield. The bottom of the photo shows the Italian left flank, while the top of the photo is the Italian right flank. The Italian artillery, Semoventi and Carri platoons and infantry platoons are shown occupying the orchards and burned out village south of the river. The Italian AA guns can barely be viewed in the top right of the photo. The French dispositions are shown clearly with a defense in depth with dug in infantry and artillery supported by two platoons of Char B tanks. RIGHT THERE!!! 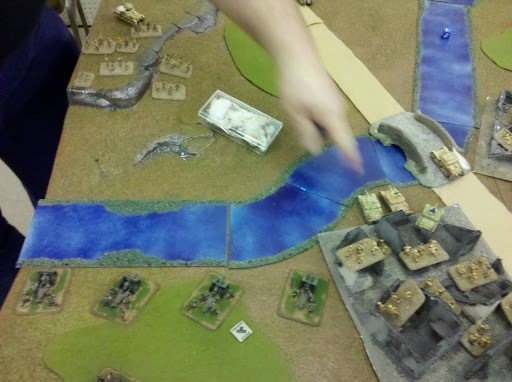 The Semoventi assault guns are playing a game of cat and mouse with the Char B tanks. The Char B's are virtually impregnible to the Semoventi's gun at this range, but there is a remote chance the French will be bailed out. The greater threat to the Char B's is the AA guns on the hill out of view. The Italian 100mm guns are bombarding the Char B's and would have engaged them in a direct fire duel if they could have seen through the orchard! A tenuous position for the Italians. The Italians charge forward after their sniper silenced the French HMG team in the ruins - much to the disappointment of the French player. The Sniper team was subsequently removed for being too close to his own troops. (Most likely he just picked up his weapon and joined the infantry in the charge for the ruins!) The Italians would not last on the hill for very long! Here we see the beginning of the collapse of the French defenses. The Italian light tanks have broken through and are heading into the French infantry positions chasing off the French Mortar platoon and parts of the infantry platoon. Without any anti-tank capability (or pioneers) the French infantry are at the mercy of the Italian tankers and the Char B tanks are in no position to assist them as the Italians are too quick and can rapidly move out of the line of fire. The French fire was ineffective as you can see the French split their fire into several platoons - doing NOTHING except bailing out two Italian medium tanks. The light tanks were missed completely, leaving them in a position to secure the roadway and harass the French infantry all the way back to Marseille. In the end, it was an Italian minor victory. They were able to secure the town (most of it and would have secured the rest in short order when the remainder of their infantry came forward. The French mistake was taking too many of the brute Char B tanks and not enough artillery and anti-tank support. 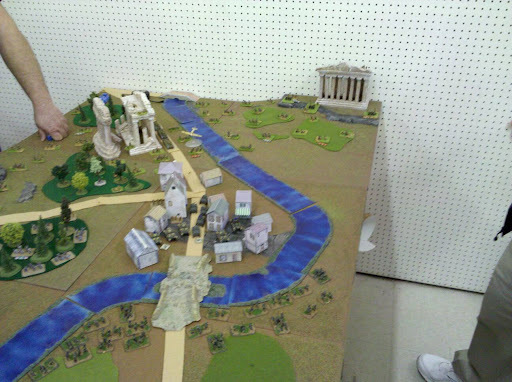 (which is of course my fault as I built two of the French lists for players to flesh out the French army - it was also a way to show case to all of the players - mainly Warhammer 40K players - that combined arms is the way to win battles in historical games like Flames of War. No single arm is capable of winning the battle. Here the Italian commanders had a robust force of infantry, light and medium tanks, assault guns, artillery, AA guns and air support. All of them did their duty well (for Italians that is!) 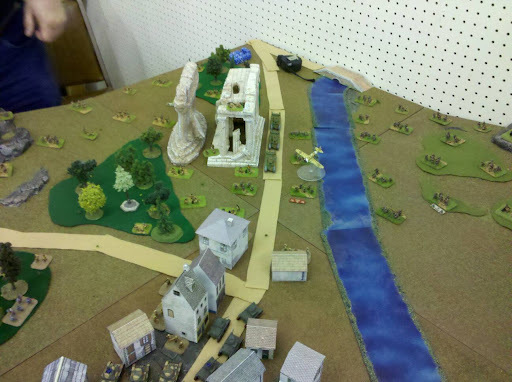 and they were able to penetrate the French defenses and then halt the French counter-assault before it even materialized. The Char B is a great defensive tank, but not so good without support in the attacking role. 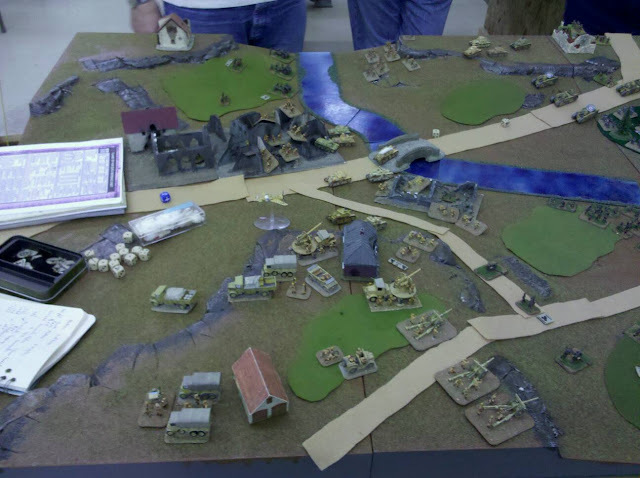 I hope you enjoyed the report - I will try to do a better report next time (when I'm not supervising a 40K campaign, a 10 year old, and teaching 3 players how to play the game! ).